Reach your fitness goal with Super HD, a powerful powdered drink that stimulates your metabolism into overdrive. Super HD, has left all other thermogenics in it's wake, with a cutting edge blend that combines a number of ingredients which promote fat loss, increasing fat metabolisation and making you feel good and focused. No other Thermogenic comes close! Created from a host of ingredients that deliver everything you're after in a thermogenic product. Aimed at reducing fat storage is an ingredient called IFAS504 with powerful appetite support. Super HD has set the benchmark in the supplement scene, and you can expect nothing less coming from Cellucor. Buy Cellucor Super HD Fat Burner from Fitness Market and save! With our efficient dispatching and quick delivery throughout Australia, Cellucor Super HD Fat Burner can be yours sooner. 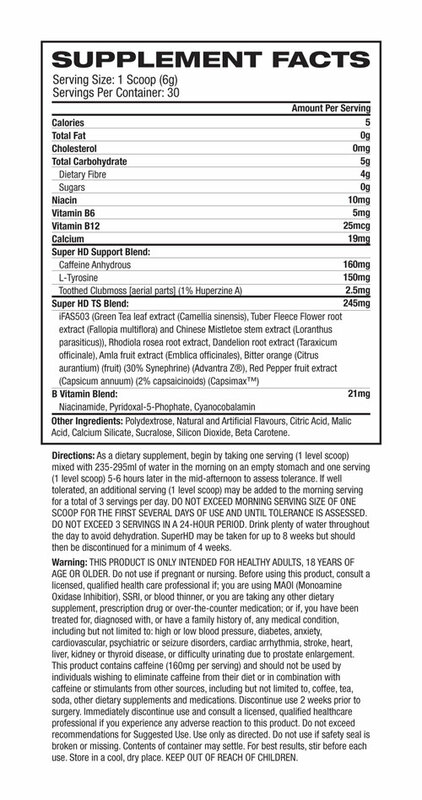 Below you can rate and add reviews for Cellucor Super HD Fat Burner.